No, it’s not a tree. It’s a mosaic brachiosaurus lurking in the crown of a tree. This downright fashionista knows a thing or two about looking peerless. Perfect addition to any decor. CONs: May spark paleontological disputes. 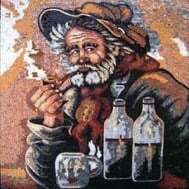 This stunning mosaic artwork is perfect as a mural for any office, bedroom, living room, bathroom room or retail space. Our mosaics are made from natural marble and stones, naturally resistant to different environments (dry, moist or wet) and weather conditions (frost, sunlight or extreme heat).